Businesses of today are dynamic in nature. What is good today, may not be so good tomorrow, and may vanish without a trace the day after tomorrow. This is why, it is critical to stay on your toes at all times and keep on evolving. Times are past when the same methodology used to drive businesses for decades. Now, with creation of new tech every next month, it has become imperative to change according to the requirements. The same goes for back office operations, which are now deemed essential yet suitable for outsourcing. 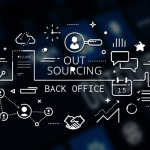 Back office outsourcing has become the go-to tool for companies, who are finding it hard to keep up with an ever-expanding business. Why Passion Can Get You in Trouble While Starting a New Business? According to Glassdoor.com, the salary of an office administrator working in New York City in the USA is $46,887 per year. That’s a handsome package for an adept administrator who can streamline your work operations and straighten out the issues hampering your business. But, when it comes to startups, not many budding entrepreneurs can afford to part with such a hefty sum, at least not in the beginning.